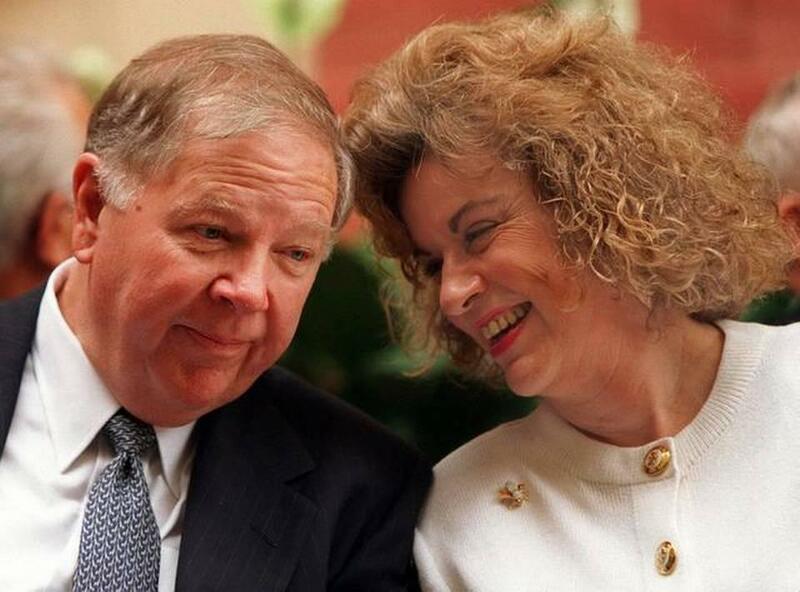 A MIAMI INSTITUTION: Robert H. McCabe, who was president of Miami Dade College from 1980 to 1995 and helped build the school’s national reputation, celebrated with wife, historian Arva Moore Parks, during the March 1997 dedication ceremonies for a campus building named in his honor, Robert H. McCabe Hall and the Betty and Alvah Chapman Conference Center. During the time Robert McCabe was president of Miami Dade College, no school in the country awarded as many associate of arts degrees. McCabe, 86, died of cancer Tuesday night. His widow, Arva Moore Parks, says her husband had a simple philosophy for education. That meant accepting every student who applied to Miami Dade College. And the students who weren’t ready for college work had to take refresher courses on the basics of math, reading or writing. But remedial courses have fallen out of fashion in higher education. Advocates say the courses add to the time it takes to earn a degree – making it less likely students will finish. Last year, Florida made the courses optional. Parks says her husband was opposed to that change. He planned to tell the Legislature it was a bad idea. McCabe also helped conceive New World School of the Arts. In 1992 he was named a MacArthur Fellow. Sixty students from the Hialeah area will graduate from high school this month like thousands of others in Florida, but these students have done something remarkable. They’ll receive their high school diplomas almost a month after graduating from Miami Dade College. The students took advantage of the dual-enrollment programs offered at Mater Academy and Mater Lakes Academy. These are publicly funded charter schools that operate independently of the district. Vice President Joe Biden was commencement speaker at one of the Miami Dade College graduation ceremonies this past Saturday. The ceremony for about 2,000 graduates of the Homestead and InterAmerican campuses was held at the Kendall campus. Biden spoke for about 15 minutes, mostly about immigration reform. He says it takes courage for immigrants to leave everything they know behind, and go to a country where they may not even know the language. Miami Dade College announced last week that it will be giving scholarships to DREAMers--the undocumented students who have grown up in the United States and would like to attend college here. MDC has joined forces with TheDream.US, who will be providing the scholarships. On Tuesday the college held a ceremony at the Freedom Tower where the 22 Miami-Dade scholarship recipients signed their scholar commitment forms surrounded by their families and advisors. This past Sunday marked 25 years since the Berlin Wall was torn down. A wall that for nearly 30 years cut off the free West Berlin from the communist East Berlin and East Germany. Miami Dade College commemorated the anniversary by unveiling a four-ton piece of that wall donated by Germany. It was raining on and off at the downtown Wolfson campus -- similar weather to 25 years ago in Germany when the Berlin Wall was knocked down.